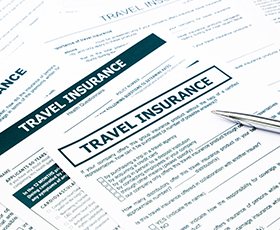 A good travel insurance policy will provide you with peace of mind. You’ll know that if you get ill or hurt while traveling, you’ll be covered for medical care in-country or be evacuated back to the United States or to another country with a high standard of health care. If your trip is interrupted or cancelled due to events outside your control, you won’t lose all the hard-earned money you spent on your travel plans. Medical Benefits, including coverage for medical costs incurred while traveling and evacuation insurance in case you need to be transported to a country with better hospitals. 24-7 Helpline – The best insurance companies will have a toll-free number you can call from any country to get assistance when you need it. A multi-lingual agent can help with issues like finding local medical care, locating lost luggage, or re-booking a cancelled flight. Allianz Global Assistance, one of the most trusted names in the insurance industry, offers comprehensive travel insurance at competitive rates. They even offer coverage for existing medical conditions, airline change fees and expenses incurred if you miss a connection, and children are covered in the policy for free when they travel with a parent or grandparent. Visit their website to learn more and get a free quote, or call Allianz at 866-884-3556 and reference ACCAM number F203493 to access preferred rates for PassportInfo.com readers.